What is knowledge? How is it different from opinion? How can I tell right from wrong – or a good society from a bad one? You’ve probably asked questions like these before. Guess what? You’ve already practiced philosophy. As a philosophy major, you’ll keep asking questions – just in a more rigorous, systematic manner. You’ll learn to think clearly and critically on the way, at the same time that you pursue ideals of truth and justice and build an understanding of the Western philosophical tradition. As for that other question you’re probably asking – What am I going to do with a philosophy degree? – the answer is: Plenty. Philosophy majors are cut out for careers in business, finance, and law, as they can cut through thorny problems with logic and precision – not to mention pursuing advanced degrees in philosophy and teaching. 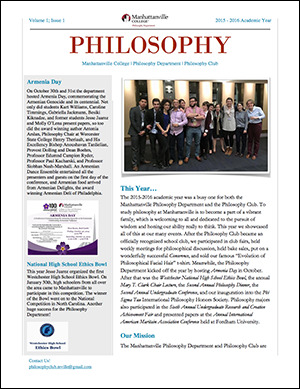 For years, philosophy has had a special place at Manhattanville: We’ve long seen it as the linchpin to the education we offer, the key to being able to analyze and understand a world that changes on a day-to-day basis. That’s as true today as it was 70 years ago. 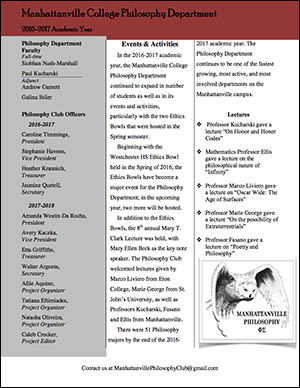 But while we continue to require courses on both the history of philosophy and the major fields of philosophy, we’re more focused than ever on what you’ll do after you graduate. You’ll focus on one of four degree tracks – the details are here – that keep you on pace for further education, career opportunities, or simply learning to apply the tenets that you’ll learn in your classes to the cultivation of a happy, satisfied, successful life. No matter what direction you go in, you’ll learn in small classes with our accomplished, dedicated faculty . You’ll also take advantage of your proximity to New York City, a hub for philosophy scholars and students. 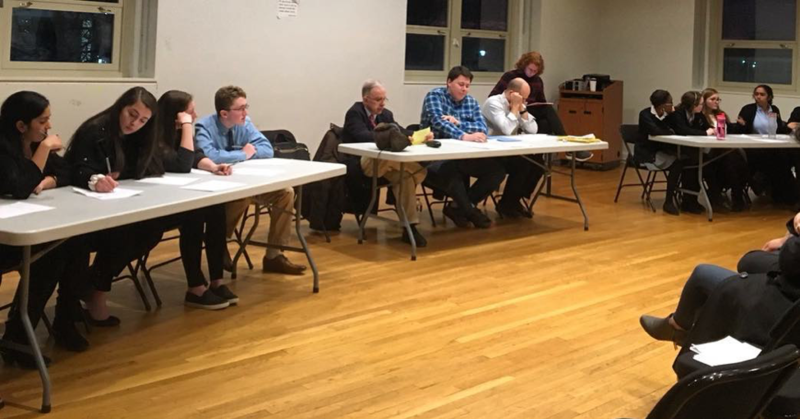 The Manhattanville Regional Ethics Bowl is an annual event hosted by the Philosophy Department. Teams from various high schools compete to earn a spot at the National High School Ethics Bowl. What is the Ethics Bowl? Unlike traditional debates, the Ethics Bowl requires a team to not simply take a pro or con side on an issue, but rather to think deeply about the proposed hypothetical scenario and create a logically sound and valid argument stating their position on the what would be the “right” way to respond to the scenario. The team will also have to respond to questions from judges. These questions can serve many purposes, including asking them to clarify their argument, and changing the scenario to further gauge the teams’ understanding of the situation and solution. Some of the topics touched upon by the hypothetical cases presented to the teams included: self-driving cars, loyalty to a nation, post-mortem sperm extraction, the Chinese Social Credit Score system, and gun control in the United States.